MOBILE, Ala. (WPMI) – On Saturday, Austal USA delivered the Navy’s latest littoral combat ship at its shipyard in downtown Mobile. Despite the talk of cutbacks, the mood downtown was upbeat as local leaders vow to fight and keep the ship building program alive for the Port City. 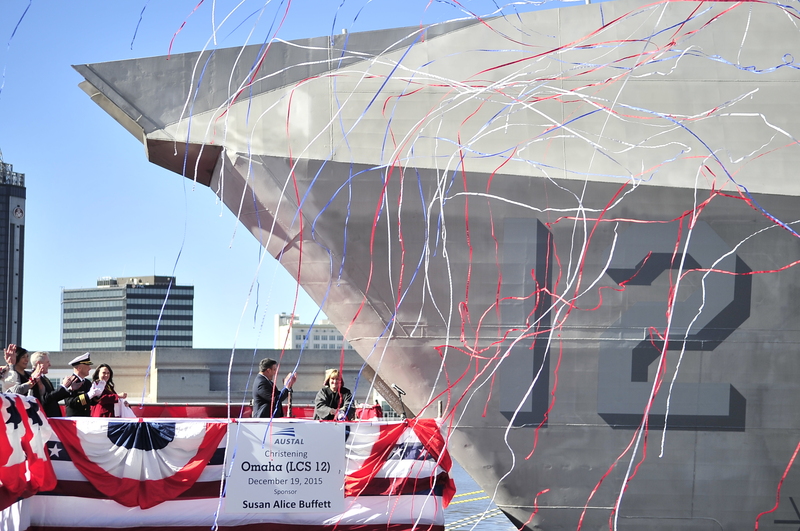 The USS Omaha is the fourth LCS ship to be christened at Austal. This as Washington politicians debate the future of the Navy’s littoral combat ships. “Ship numbers and ship counts have been banded around for political gain and when that happens they do a disservice to our sailors, to our marines and to our ship builders,” said Secretary of the Navy Ray Mabus. “For as long as they say we need these ships and as long as Congress supports that we feel we will be in a pretty good shape and a good place going forward,” said Craig Perciavalle, President of Austal USA. This LCS is a 419-foot aluminum trimaran, capable of being outfitted for a variety of missions. Missions at sea that may be affected after defense officials told the navy this week the LCS program may be cut back. Alabama’s Congressional Delegation vows to fight for the program which employs more than 4,000 workers in Mobile. “There’s going to be a broad based coalition in Congress to push back at what the Secretary of Defense has proposed. Now this is a proposal. The final decision on this is with the United States Congress,” said Republican Congressman Bradley Byrne. Defense officials say they want only one company to build future vessels. Currently Austal USA is one of two ship building companies that builds the combat ships. The new plan calls for building only six of the combat ships between the fiscal years of 2017 through 2020, that’s eight less than the Navy submitted in its original plan. This entry was posted in Christenings and tagged christenings, uss omaha. Bookmark the permalink.